It’s not just good, it is deliciously good, and yeah, healthily too. Munching on chocolates is your guilty pleasure? Yes, did you really say Guilty? Why? Feel great about yourself and your love for chocolates, for this sumptuous treasure for the taste buds is not just good to the tongue but to various other body parts and functions. If you are afraid to binge on the chocolaty, thinking about the amount of sugar that goes into your system, then my dear, like anything else- excess of chocolates is also bad, but if taken in sufficient quantities and having the right kinds then chocolates can prove to be a super healthy option (a small portion of a chocolate pastry isn’t a bad dessert choice afterall). Helps Keep Your Heart Healthy: Chocolates is known to reduce the risk of stroke, as well as prevent many other cardiovascular diseases. The compounds present in chocolate are found to fight against the bad cholesterol (LDL) and increases the level of good cholesterol (HDL). Many a researches have all come down to conclude, that eating chocolate surely reduces heart risks, as no counter observation has till now. It’s a Mood Elevator: Easily the best way to feel better when low. Grab a chocolate bar, and your nerves will soothe. Chocolates are best known for their mood-lifting characteristic, as some chemical compounds in chocolates conspire to positively distract your mood. The chemical, Phenylethylamine, which is produced in the brain that makes you have the feel of being in love, is also present in chocolate. No wonder you’ve heard of the orgasmic effect of chocolates. Powerful Antioxidant: A power house of antioxidants. 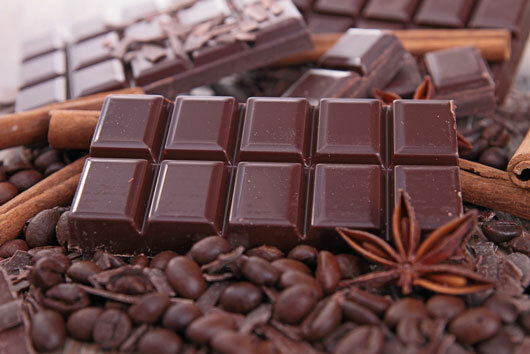 Dark chocolate has these wonder elements that help your body get rid of the free radicals. Free radicals are said to be stimulating aging as well as be a major cause of cancer. It is therefore good to include in your healthy diet plans food items that are rich in anti-oxidants to fight these harmful elements in the body. Improves Brain Function: Chocolate is proven to improve the cognitive function of the brain, as it improves blood circulation to brain and heart. It is due to the cocoa that is found in it, which also has caffeine and theobromine which act as stimulants that result in short term better brain functioning. Consuming chocolate has also been found effective in improving verbal fluency in many people with related issues. Protects Your Skin & Provides Glow: Eating chocolates is one of the healthy habits for glowing skin you should adopt. Chocolates that are rich in high flavanols are observed to have a protective role against the sun. Also, this sugar doesn’t cause acne or breakouts. In fact chocolate massages and spa treatment can provide enviable glow to your skin. The antioxidants help your skin get firmer, and plumper. The caffeine improves circulation which in turn rejuvenates the skin. Prevents Tooth Decay: Sugar is definitely the worst enemy of your teeth, but not necessarily chocolate, or atleast dark chocolate. Chocolate comes from the source cacao, which has high antibacterial agents. The amount of cacao in white chocolate is significantly low as compared to the sugar content. It is however, the opposite in case of dark chocolate. Therefore, high cacao content in Dark Chocolate can help prevent tooth decay too. Chocolate Consumers Live Longer: Regular chocolate eaters are observed to have a longer life span than those who stay away from this tempting food item. Researchers of Harvard too back this observation, and have found chocolate consumption adding almost two years to one’s life expectancy rate. Isn’t that the most easiest (delicious) way of ensuring to live longer?! Surprisingly, Can Help in Weight Loss: Picking up dark chocolate over others, as part of your weight loss diet may not seem like the logical option when calculating caloric content of different foods, but it is actually quite the right thing to do. The reason being, dark chocolate can effectively control your cravings for not just more sweets but also for other salty and fatty foods. Having dark chocolate in moderate amount can help you stick to your diet routine better, due to it’s satiating effect.